If you don’t know all the ways to monitor credit reports and scores, you’re missing out. Because once you realize there are as many as 22 ways to go about it – both free and for a fee – the more effectively you can pick and choose a combination of things that works best for you, an essential tool in maintaining good credit, repairing bad credit, and catching mistakes and fraud so as to minimize damage. Thanks to the Fair Credit Reporting Act, you are legally entitled to see copies of your credit reports – for free and from all three major credit bureaus – every 12 months. You have to request them, though, through AnnualCreditReport.com. You will also be asked questions to verify that it is, indeed, you making the request. If you’d rather not request your credit reports online, you can make your request by phone at 877-322-8228, or by mailing the Annual Credit Report Request Form to P.O. Box 105281, Atlanta, GA 30348-5281. Should you request all three at once? You can request all three credit reports at once or you can stagger them throughout the year. If you’re planning to apply for credit anytime soon – and you’re not sure which credit bureau the creditor is going to use – it’s probably a good idea to see all three so you can catch any errors and try and correct them, need be. You can monitor your credit reports (and scores) for free anytime you like when you sign up for any of the free credit monitoring sites listed below. You will, of course, have to give these companies access to your credit so that they can pull your credit report information and scores from the credit bureaus. Note, however, these do not count as hard inquiries so they will not affect your credit. As you’ll see, not all of these sites provide information from all three credit bureaus. So, in order to monitor all three, you’ll need to sign up for multiple sites. Also, though all of these sites offer free ways to monitor credit, be aware that you may see offers to upgrade to a paid subscription plan. UPDATE: Many free credit monitoring sites will not work when you have a credit freeze in place. Yet, in the wake of the Equifax hack, keeping a credit freeze on all of your credit files is recommended on a pretty much permanent basis. Note, Credit Karma will work with a credit freeze in place; you’ll just need to unfreeze it to allow Credit Karma access to your credit files then re-freeze after the sign-up process is complete. Through its CreditWorks Basic plan, you can see your Experian credit report every 30 days. This includes credit alerts and toll-free phone support. Note, a credit freeze does not affect Experian credit monitoring. Just because a credit bureau tells you they’re going to make a change to a listing you disputed, that’s no guarantee it’s actually going to happen. Make sure it does by requesting a copy of the credit report so you can see the change with your own two eyes. The sooner you catch fraudulent activity, the more you can minimize the damage. That’s why it’s so important to request copies of your reports if you have been a victim of fraud. You could catch fraudulent uses of your existing credit or new credit lines that a thief opened in your name. Though your receipt of public welfare assistance will not show up on your credit reports, receiving it does entitle you to an extra credit report every year. 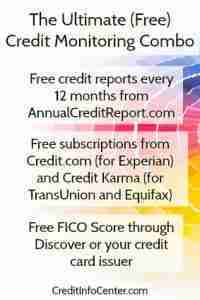 Your entitlement to a free credit report via AnnualCreditReport.com is a federal law. So, if your state has a similar law of its own, that could get you another free report during the same 12-month period. For a fee of $39.95, Experian says you get one-time access to your credit reports and FICO Score 8 from all three bureaus. UPDATE: In response to the hack, Equifax is not offering paid subscriptions at this time, but free credit monitoring through TrustedID Premier. Learn more. Only you know the combination of approaches that works best for you to monitor credit reports and scores. But here’s one way to do it. Then for those times when you’re ready to finance something big – like a car or a house – it’s a good idea to pay to see the credit score lenders are likely to use in that lending decision. The FICO Score 3-Bureau Report will give you one-time access to that information, or go with the FICO Ultimate plan for monthly access (to the same information), which you can cancel anytime. Bad credit? Get the facts on DIY credit repair.